This pair of medium black Men's Stretch Thinsulate Gloves from Freehands are designed to be used when photographing outdoors in cold weather. The gloves have a waterproof and windproof backing and are lined with Thinsulate to keep you warm in the winter while being lightweight enough to wear in milder weather. When photographing in cold weather you can open the finger tips so that you can more easily access small buttons on your camera, which might be difficult to access if you were wearing normal gloves. When you need to access buttons on your camera, simply pull back the thumb and forefinger tips of the gloves to reveal your fingers. The tips are secured in place by magnets until you are ready to cover your fingers again. The palm patch features a silicon grip to prevent your camera from slipping. The gloves are designed to fit snugly so you can hold and operate your camera easily. For a looser fit, order the next size up. Box Dimensions (LxWxH) 9.4 x 4.2 x 1.9"
Men's Stretch Thinsulate Gloves (Medium, Black) is rated 4.1 out of 5 by 121. Rated 2 out of 5 by Anonymous from Great gloves, but not for the cold Bought these gloves to replace my everyday warm gloves and have the flip fingers to access camera controls or cell phone. Wore them for the first time in a warm winter day 5C (or 41F) and my index and thumb got cold with the covers on. The next day -13C (or 8F): 1 min walk, 1 min drive, 2 min walk. My fingers were frozen I had to but them in warm water for a couple of minutes. These are not winter gloves. Cool summer night, maybe a warm spring day or a warm fall day, but even then. I was at the top measurement for a medium glove, the glove fit well, but the flipable fingers had a tight fit (could this be the cause of the cold fingers? Maybe, but don't think so). Rated 4 out of 5 by brasc from FreeHands A I use these gloves for photography in cold weather conditions. They are quite good, but could be improved sightly. They are particularly warm for how light they are. They provide the best tactile control over camera controls of any glove I've tried even with the index finger and thumb covers in place. My only knock on them is the placement of the magnet on the fore finger and thumb. No one seemed to have the foresight to NOT place it right on the knuckle of the finger and thumb. This placement creates a measure of discomfort when using those fingers. That said it is not a terrible thing to have to live with, but is mildly annoying and restrictive. I'm still going to use them. Rated 4 out of 5 by JoshW from Seemed OK, but small. I don't have large hands. I'm 5' 7 and of average build. I always wear medium. These were tight. Sent back and received the large (reviewed separately) which fit just fine, but are not large. I recommend ordering a size larger than you normally wear. Rated 1 out of 5 by MichaelK from Terrible magnet placement I don't believe they've tested these in the field for one minute. They've sewn-in these circular magnets, which are supposed to hold the two finger flaps open. Great idea, and the magnets hold them open just fine. But on the index finger, they've sewn the magnet right on top of the join. So whenever you bend your finger even slightly, you've got a hard metallic magnet pushing against you. I've had to give these to a local tailor and remove these magnets completely. One star for a good idea that was never tested. Rated 4 out of 5 by Anonymous from Smart Purchase! Good product overall. I'm a cameraman and was headed to Ireland to shoot part of a documentary. I knew it was going to be cold, but I need to be able to access all of the controls on the camera. These gloves worked perfectly. They're not extremely warm, but it's much better than not having any gloves on which was my alternative. I bought medium which is what the size chart recommended, but large would have been closer to my size. I decided to keep them since having them tighter actually makes it easier to handle my camera. This purchase was totally for the practical aspect, not comfort or extreme warmth. I would recommend them! Rated 3 out of 5 by bokeh82 from better than nothing The fingers on these were a bit short which only really affected the flip overs on the thumb and index finger. While most of the glove is well thought out and warm the tips of the thumb and index finger are just cloth on the bottom with no real insulation which leads to problems with first stage frost bite and only slightly extends your ability to shoot in freezing temperatures. While these or better than nothing them do need improvements for being fully functional in cold weather shooting. Rated 4 out of 5 by Ken from Vegas from Fingers and overall length a bit short I have an 8.5 palm. The sizing chart suggests that I order a medium. Fine in the palm, but my fingers barely fit. It is also a bit short on my wrist. I don't have long fingers. Normally I wear Large gloves, but ordered the medium based on the size chart. When in doubt, I would order a size larger.Otherwise, they are warm and the finger flaps work as advertised. Not too bulky. Palm grip isn't very grippy. Stretch fabric isn't very stretchy. Still, a useful glove. I would order again, but get a larger size next time. Rated 3 out of 5 by isaac from Needs some user feedback for next model! I used this product in roughly 25 degree weather out on open water surrounded by arctic ocean and was hoping for a little bit more warmth out of them. Pointer finger and thumb finger have excellent magnets for keeping the fingers open however when closed, does not close all the way and causes those two fingers to freeze. I wouldn't mind a better closing mechanism as well! All in all though, not bad for short periods of time in cold weather. I think they could handle a NY winter where you can go inside and defrost for a few minutes every hour or so. 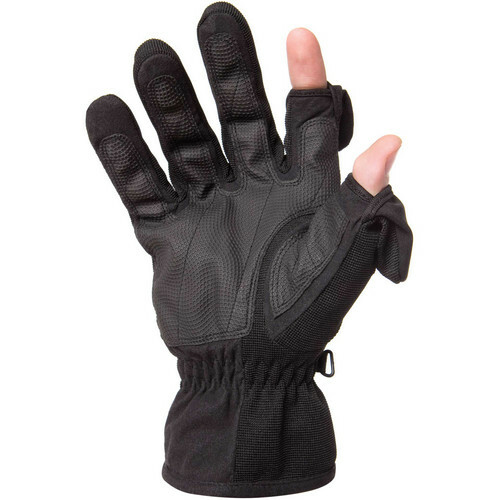 The Freehands Men's Stretch Thinsulate Gloves are sold as a pair. How do I wash these gloves? I've used mine for a year and a half in all types of bad weather so they probably need a bath. Carefully. Suggest soaking in warm (NOT hot) water with a mild detergent. Then, after a couple hours transfer to cold water to rinse soap. Line dry. Washing machine or dryer not recommended. Note, this is what I would or will do; it's not a manufacturer's recommendation. How do I know my hands size? If your size (M )you have ask for X large.